When your coffee cup brings you joy long after the coffee is gone, now that’s money well spent. 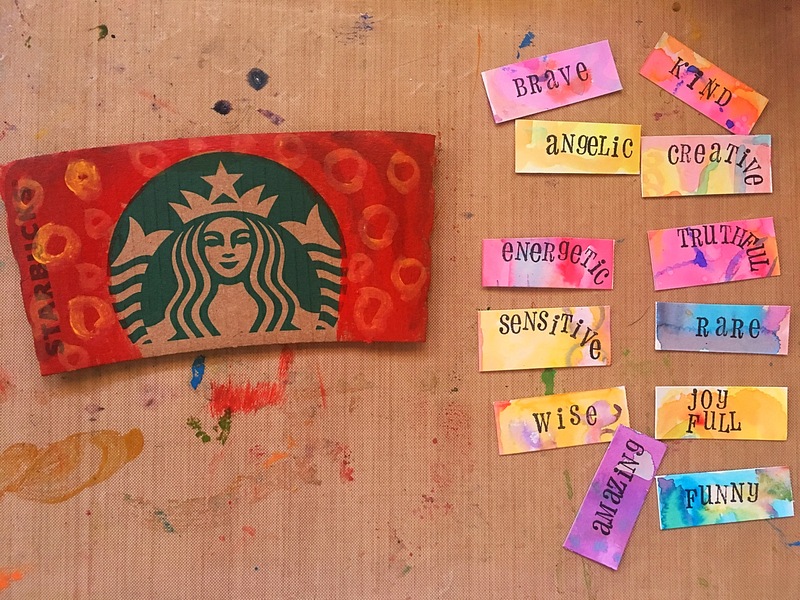 If you are a coffee drinker and a crafter and in addition to the boost of caffeine you need a little boost with positive affirmations now and then, then a coffee-cup-sleeve affirmation mobile is for you. I don’t frequently stop to get coffee, mainly because nowadays my drive to work takes place at 3am. 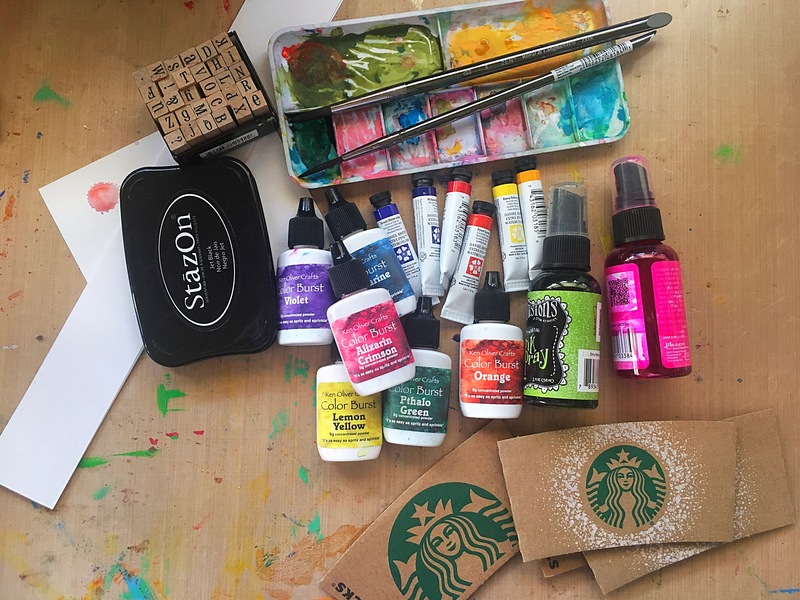 But even when I used to work more regular hours, the crafter in me would rather spend the few dollars on craft supplies (think: fabric, paper and tools). A few days ago I was cleaning out my old purse and I found three coffee cup sleeves. I’ve been saving them. I always knew there was a potential for them to be repurposed. And the time has come!! I’ve been feeling a little down (typical life struggles of working parents) and I’ve been keeping a good supply of self-help books from the library by my bed side. I’ve been writing down some positive affirmation words, little reminders to get me through the day and in a positive spirit. So when I came across the coffee cup sleeves a light bulb went off. As a good crafter I stopped cleaning, who am I to dismiss an inspiration moment! Off to the craft room!!! A good supply of positive words and affirmation you’d like to tell yourself or you’d like someone to remind you of the nice things about you. 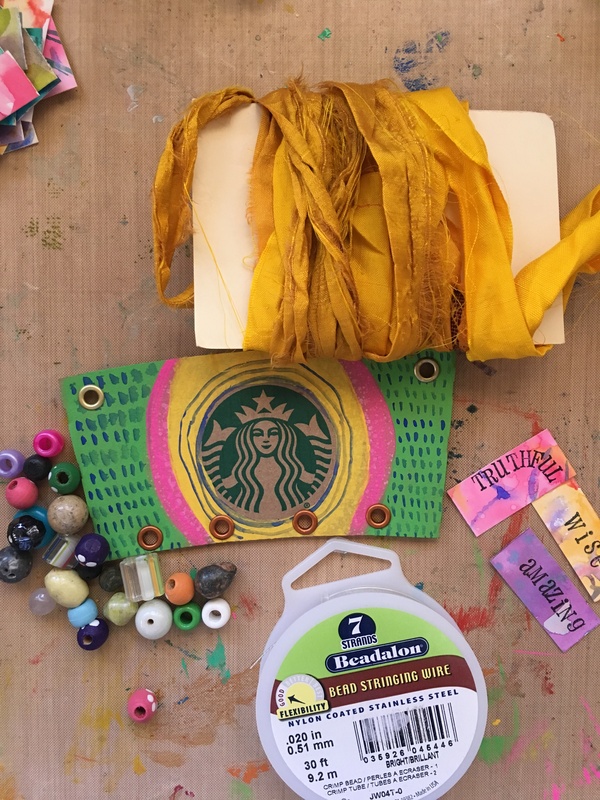 Color and decorate the coffee sleeve. Punch a hole in each of the top corners. Punch 3-4 holes across the bottom edge. If you have grommets you can put them in the holes. If not, that’s OK. You can still do this. 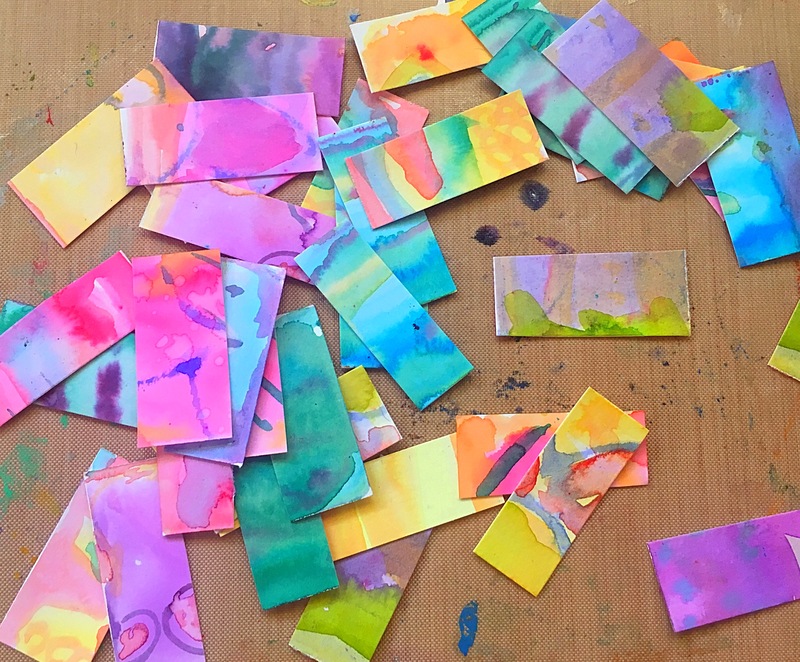 Make a watercolor wash on the watercolor paper. Cut it in strips (1″ x 2″ or 3″). Stamp out your positive affirmations. Here are some ideas: kind, amazing, energetic, wise, blessed, thoughtful, sensitive, beautiful, brave, friendly, funny, creative, joyful. Put beading wire through each of the holes you punched on the bottom. Use a bead stopper to secure the wire. String beads and the strips of paper with your affirmations. Your wire length doesn’t have to be even in each hole. Play around. Secure the beading wire at the bottom with a bead stopper. If you created a loop at the bottom with your wire you can use it to attach some fringe if you’d like. Attach sari silk or ribbon through the holes you made on the top of the sleeve. This will be used as your hanger. 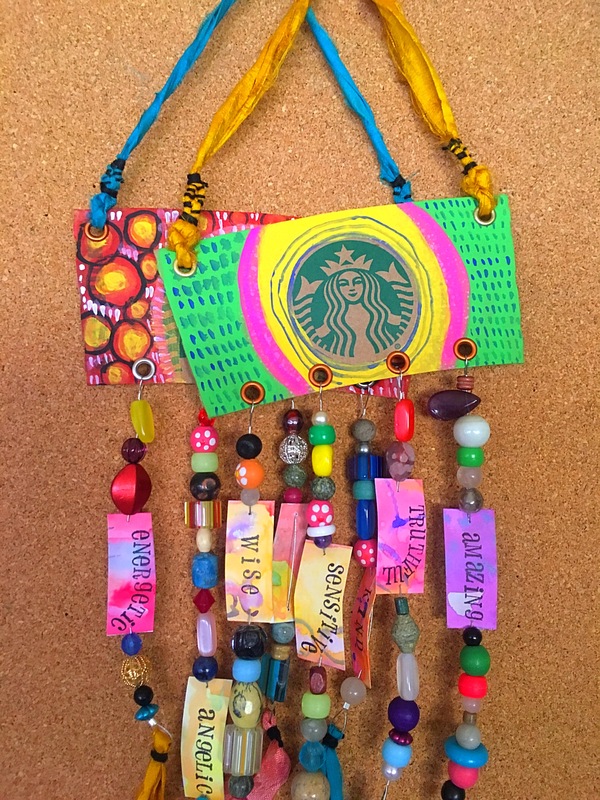 Hang your coffee cup mobile somewhere you will be able to frequently see it and remind yourself of all the beautiful things that make you YOU!